18 – 19 October 2017, 7th Central Asia Trade Forum, Almaty Kazakhstan. Attending the CATF in Almaty, UAVAid co-founder, Daniel Ronen, delivered a talk to a mixed business, government and NGO audience on the latest developments in UAV technology for Development applications. The speech included an outline of the Hansard platform, as a Frontier Technology, with its multi-role capability, and an emphasis on the wide range of applications that drones were able to support in development applications. UAVAid was invited to participate in the event by Crown Agents Central Asia, who were one of the lead sponsors of the CATF event. 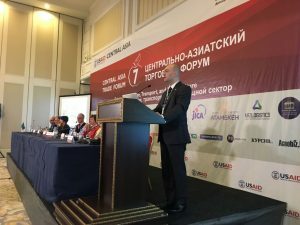 UAVAid co-founder Daniel Ronen spoke about the opportunities for UAV’s to improve living standards and public healthcare, at the Crown Agents organised session of the 7th Central Asia Trade Forum, Almaty. The talk was part of the Frontier Technologies: Practical Issues in Frontier-Technologies session, and was followed by a Q&A session for the panel of speakers and experts. The panel session was moderated by Ms.Larissa Kokareva, Regional Manager for Central Asia, and other speakers included Ms. Marie Staunton CBE, Crown Agents Chair, and Phil Norley, Crown Agents Customs and Trade facilitation expert.